Hong Kong Customs yesterday (November 29) seized about 8.3 kilograms of suspected ketamine with an estimated market value of about $3.9 million at Hong Kong International Airport. Six male passengers arrived in Hong Kong from Kuala Lumpur, Malaysia, yesterday morning. 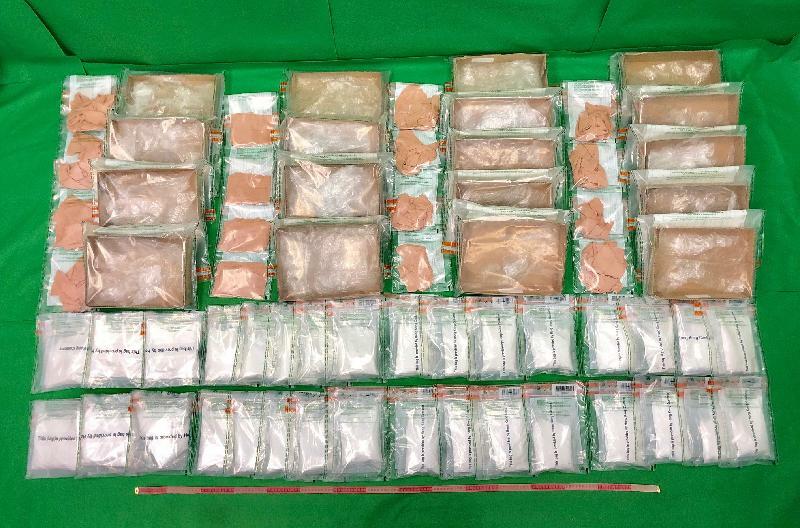 Customs officers found the suspected ketamine, weighing about 8.3kg in total, wrapped on the bodies of four of them. The other two male passengers were suspected to be involved in the case. The six men, aged between 18 and 28, were then arrested. In addition, Hong Kong Customs has seized over 5 tonnes of khat leaves with an estimated market value of about $31 million from January to November this year. Khat leaves contain traces of cathinone and cathine, which are both controlled under the Dangerous Drugs Ordinance. Hong Kong Customs has all along been working closely with the logistics industry, and will continue to take stringent enforcement actions as well as strengthen co-operation with law enforcement agencies outside Hong Kong in combating transnational drug trafficking activities.